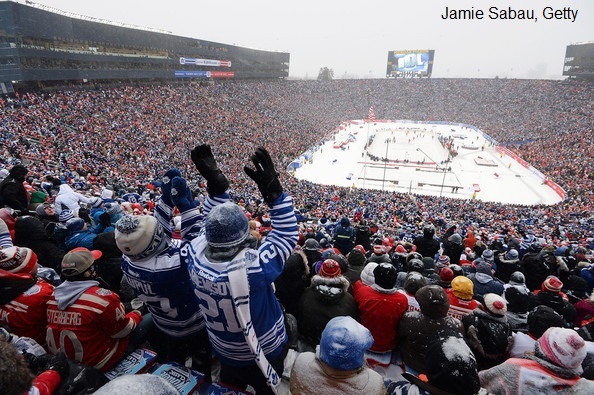 ← Winter Classic Fan Zone: FUN ZONE! 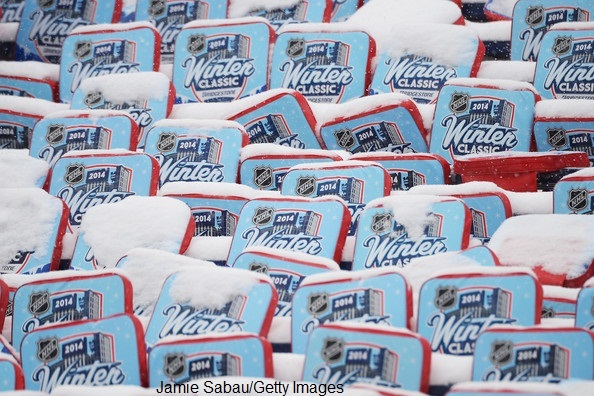 Don’t buy in the hype the media lays on with a trowel about the Winter Classic. They love their precious narrative about a boy’s love of the game in its purest form, but they have no clue. They are firmly ensconced in warmth with snacks and accessible clean restrooms. 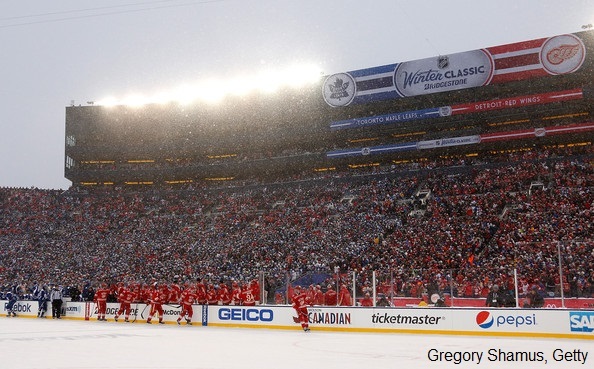 The Winter Classic is all about endurance and grit and surviving the insanity of a 14 degree blizzard through three periods, overtime and a shootout. It’s about paying five dollars for a tiny hot dog with a bun so dessicated it could be used as a puck. It’s about waiting in line for a poorly ventilated bathroom where the floor is covered in liquid you hope is melted snow but you know is one hundred percent urine. But that doesn’t fit into the media’s highly romanticized version of what is essentially an incredibly expensive (and as it turned out) dangerous game to attend. The outdoor guys calling the game like Doc will talk about how they don’t have a kerosene heater, but they at least they have a heated bench and people to bring them hot cocoa and a golf cart to take them off the field to a nice safe warm bathroom. They aren’t thrown to the wolves. Heck the players even get heated benches. Certainly, the weather has its own agenda and won’t be bullied into submission. While the continuous snow made for a wondrous backdrop, it also made for dicey driving. On our way, Long Suffering Partner (or LSP) and I saw six vehicles that had spun into a ditch. Or each other. Once safely there and on our way to the stadium, we passed several tailgating groups some of whom seemed to be approaching Rob Ford levels of drunkeness (BAM! Topical AND Canadian!) We skipped the Fan Zone set up outside the Bridgestone Winter Classic. We had pretty much the same experience at Comerica Park except for the free Advil they were handing out (popular with the party crowd). 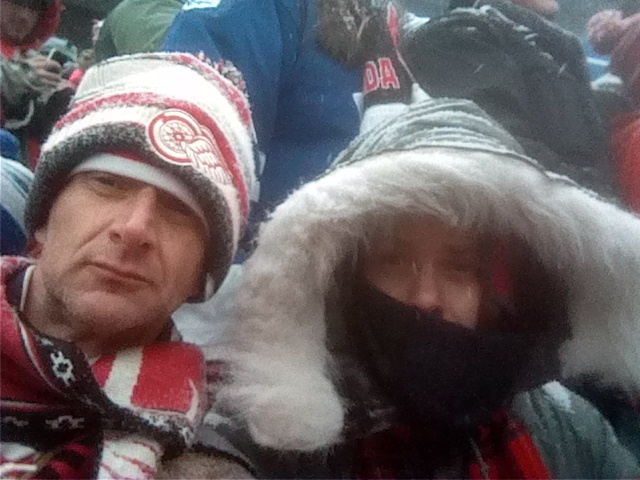 Even inside the stadium’s concourse, it was cold enough that I broke down and purchased a Wings toque and scarf (a mere $65!) from one of the hundred outside merchandise tents since the heated store had a ten foot line. Most likely because it was the only warm place available. 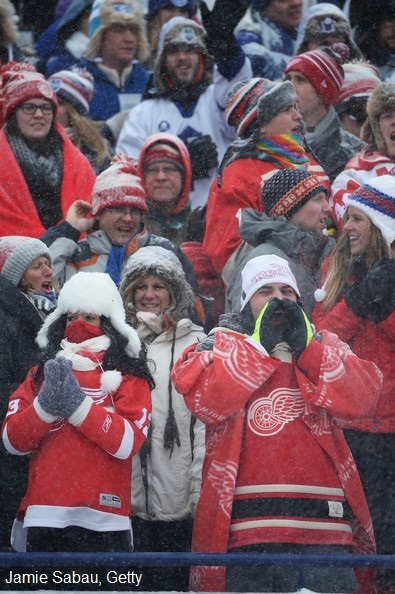 Why weren’t their warming zones other than the ones outside the stadium? Did I miss those? Could they find no one to sponsor one? Was I supposed to buy cheesy fries and warm my hands over them? Granted, we never made it all the way around the stadium but we tried to huddle inside the concourse area for warmth as much as possible. Besides the aforementioned five dollar hot dog, LSP and I got hot chocolate that was already tepid by the time it got to us. Although it came in a lovely commemorative cup for only ten dollars. For an extra six dollars, you could get a shot of Baileys in it. Baileys? Hot chocolate is already sweet. The perfect accompaniment to hot chocolate is Peppermint Schnapps. Everyone knows this. I’m sorry if you believe differently, you are wrong. Maybe if Baileys had sponsored a warming zone, I might have purchased some. But with the driving conditions unlikely to improve, no way was I drinking alcohol. I didn’t want to be a cautionary tale. About drinking and driving that is. The view from our seats was a beautiful snow covered panorama. That is after we dusted the two feet of snow of them. Special seat cushions were on each seat, but they also had snow on them and were obviously very cold as well. Better than the metal however. Inside the pocket of each cushion were a packet of trading cards. Both our packs had a Tyler Bozak card. How I hate you, prophetic fate. As entertainment (?) after warmups the NHL provided Mayer Hawthorne. I wasn’t certain if they were playing live or just faking it to a track. 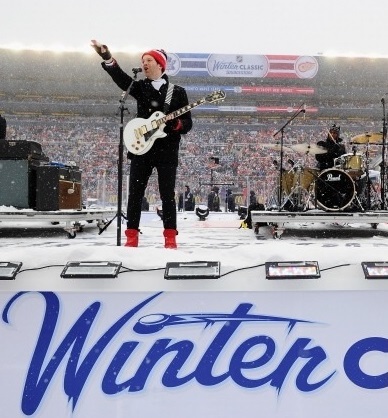 I can’t imagine that a cymbal would sound as rich in that brittle snowy environment, but in that stadium I mostly heard the rhythm section which was probably for the best. Even the over the untrained mob, I could hear the lack of proper training of the Tenors. The lead in particular was terribly flat. You would imagine that a group on a worldwide arena tour would be used to singing in larger space acoustics. But here’s the dirty little secret: if you have a group of tenors, someone’s gotta be the baritone. And we all know what that means. (Note to my mother: I really have no idea what that means). The Zac Brown fared better as they opted not to sing the American anthem like a dirge. Bonus points for nailing the interval of “what so PROUD-ly we hailed” since if that gets off, it’s pretty much downhill from there. Anthem Recap: The Tenors – well groomed (and marketed) but fairly poor musicianship. Zac Brown Band – look ready for a bar fight (and they would win) but hold a tune and actually respectful to the spirit of the anthem. Also, the first time I have ever seen fireworks in a snowstorm. And I really didn’t see them that well. Oh right. The Game itself. Certainly, the first period was a slogfest as players watched the puck get trapped in a snow bank while they skated forward. There were several offsides (where we were subjected to yet more ads) until the teams decided to dump and chase into the zone or in the Wings’ case, just give it to Pavel Datsyuk to stick handle into the zone. The ice needed to be shoveled constantly otherwise you couldn’t even see the blue line. 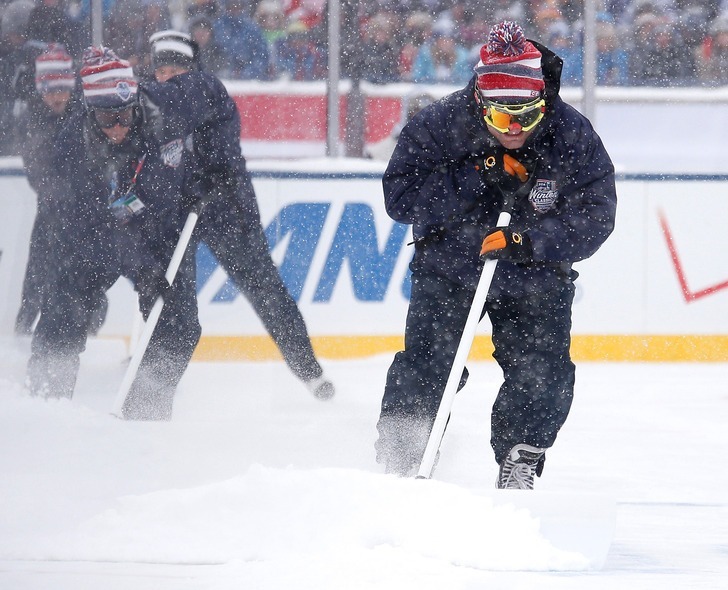 The crew was quite proficient at this, but at the end of the rink where they dumped the snow there were two people constantly shoveling snow out of the way to make way for the snow off the ice. Why a snowblower wasn’t used is beyond me. 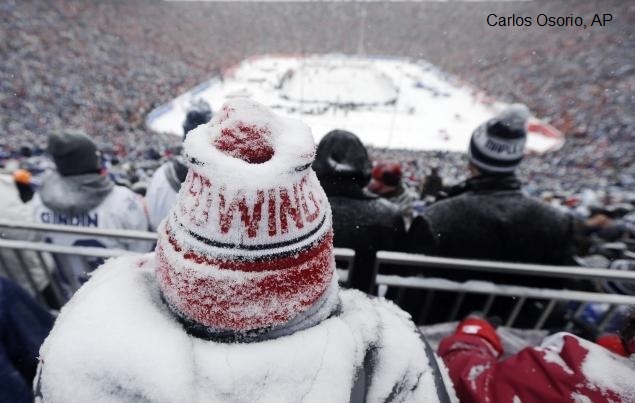 Maybe there’s some snow shoveler’s union at the University of Michigan – if so, I apologize. I have now come to the darkest part of our adventure: the intermission. Our plan was to meet up with actual operatic tenor @DylanHayden at the break. In retrospect, this was a enormous mistake as everyone else had the same idea. Once the horn sounded, every pathway was blocked with people seeking bathrooms, concession stands, or just a warmer spot. In the concourse, the crowd was just an unmovable mass all trying to head in completely different directions pushing and shoving from all sides. More insanity after the jump. Some wags started mooing like cattle, but that’s not an apt metaphor for the situation. Cattle have a clear chute to the abattoir and it can’t be a stampede if there’s no movement whatsoever. It was amusing to hear comments like “This is just like the standings. We never move!” (applicable for both teams) but disheartening to hear “I have a small child here!!! Please stop pushing!! !” while you are trapped in a mass of humanity. Eventually after ten minutes of trying to get through the crowd Tetris style, we gave up and managed to sidle over to a gate facing the street on the concourse where it was only partially dense. And there I saw it. I saw large, pasty buttocks. Then I realized they were attached to a squatting man pooping into a clear plastic bag. Some things cannot be unseen people. True, he was trying to hide behind a garbage can, but it was too late. The thin veneer of society had already been shattered. Guys started peeing through the gate on the concourse down to the street level. And not attractive guys either. The smoking ban was completely ignored. Someone was even smoking a joint. He was popular. When a stadium worker finally walked by, he merely said “There’s no smoking. You have to put that out” in a school-marmish scold. He obviously knew he was outnumbered and didn’t want trouble. Why was this allowed to turn into anarchy? 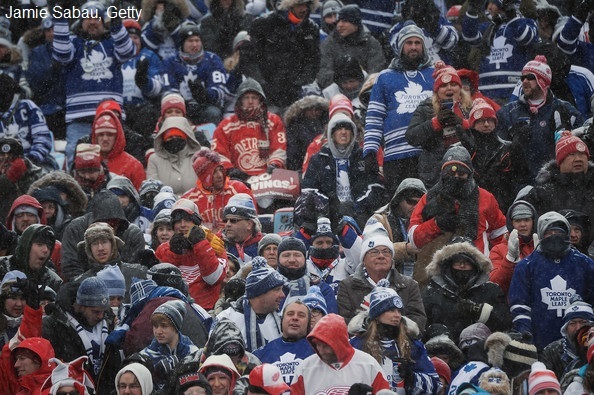 Why isn’t there an NHL Department of FAN Safety? (I’m looking at you, Patrick Burke. 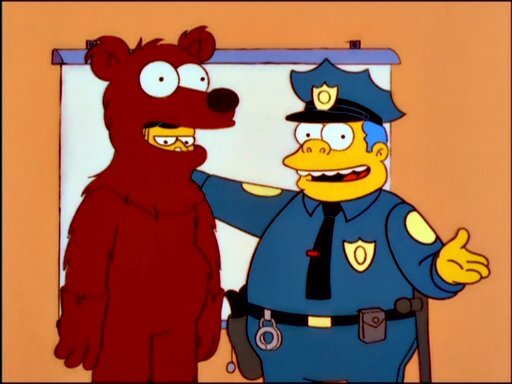 Maybe you can wear the Curtis E. Bear outfit). Once the crowds finally abated enough to venture back, we walked along a path of lone gloves, scarves, hats, blankets, even seat cushions all trampled and covered in filthy slush – a scene of forlorn desolation like the aftermath of a violent diaspora. The only mitigating factor was that I didn’t have to hear Mayer Hawthorn perform again. We missed around ten minutes of the second period (and we will never speak of it again – I saw a man poop in a plastic bag, people) but we made it back in time to see the first goal of the game. I was glad it was Alfredsson, he’s been a favorite of mine for a while even when he was with the Senators. Or maybe because he was with the Senators. Anyway, suddenly the contest grew more exciting as players remembered there were two desperately needed points on the line. The pace picked once everyone became accustomed to the conditions and started using them to their advantage. You watched the game anyway, otherwise you wouldn’t be reading this. We don’t need to rehash the Bozak business or the Zetterberg breakaway stopped by the buzzer in overtime so they could change sides. Whatever. Everyone knows he would’ve scored. Even the guy wearing a Flyers jersey at the airport the next day. Everyone knows. So, there’s that. If you want to see the game, they will play it on the NHL Network every now and then, presenting it with a wistful air. But that’s how I will choose to remember it. I won’t want to remember the monstrous traffic snarl caused by the lack of planning by the city of Ann Arbor. Well, they had a plan. It was to treat it like any other home football game they hold. Well, guess what? It wasn’t like ANY other game at that stadium. A city official went so far as to blame the NHL for not educating the fans on how to exit the stadium and the town. That’s what the police are supposed to do. Why don’t you just shake your fist at the sky and blame the snow for not listening to you either, you pathetic old coot. I’m sorry. He deserves worse language than that, but my mother reads this. What I am going to remember is the incredible adventure that my Long Suffering Partner and I had where we saw our team earn a point. 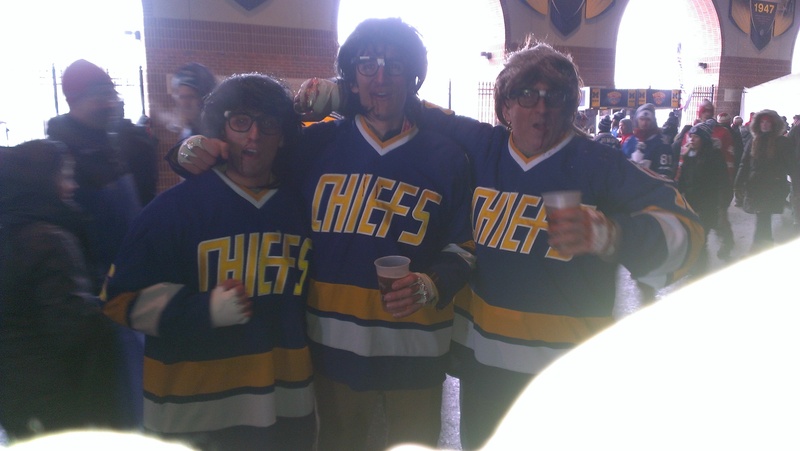 But we also saw some guys dressed as the Hanson brothers from Slapshot. We danced and sang along with a hundred thousand some people to the like of the Beastie Boys and Franz Ferdinand. (Journey’s “Don’t Stop Believing” will be a long cherished memory) I watched people drink nine dollar beer slushies with ice in their beards. 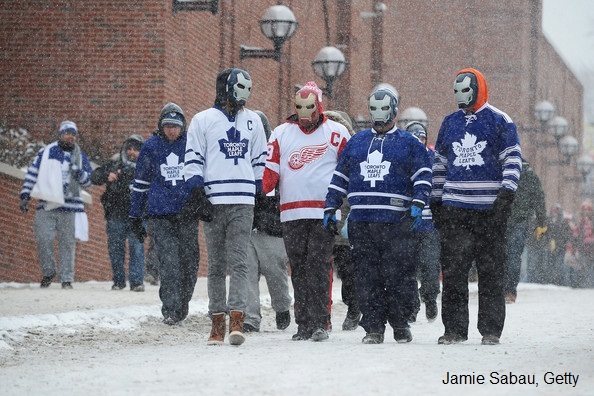 I was with a mass of humanity enduring the coldest Winter Classic ever. 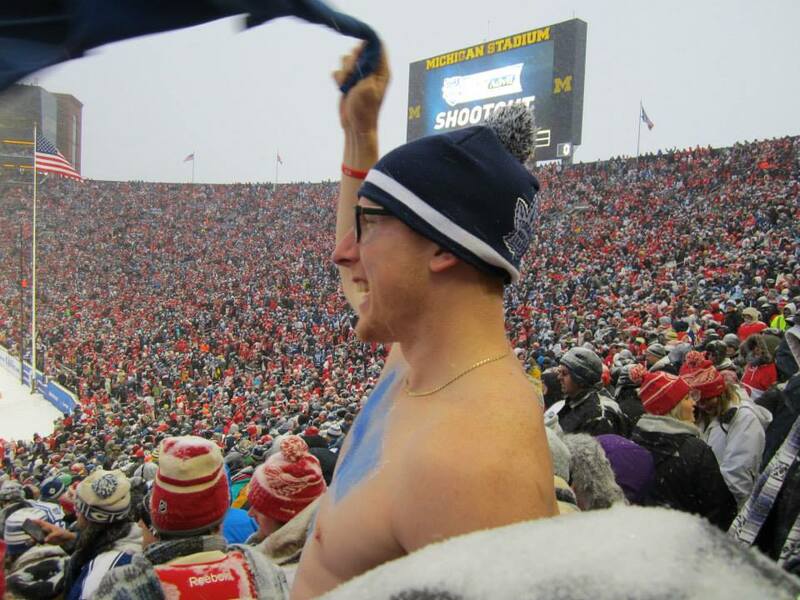 We even saw a guy go shirtless before the shootout to whip the crowd into a frenzy. Yes, he was a Leafs fan, but he was still kind of cute. Eric Pinder is an actor/writer/director/sometime hoofer originally from Detroit suburbs. He does not know Eminem, please stop asking. His tweet about a man pooping in a bag quickly went viral and earned him twenty new followers. He was promptly unfollowed by half of those people when they read the rest of his tweets. Follow him @operahockeyguy. 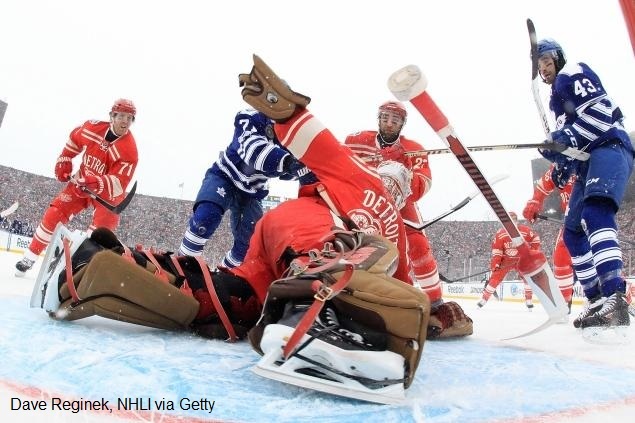 This entry was posted in Detroit Red Wings, Toronto Maple Leafs and tagged All Work and no hockey makes Eric something, Pavel Datsyuk, something, Stanley Kubrick, The Shining, Tyler Bozak, Winter Classic, Winter Classic 2014. Bookmark the permalink. Eric – great job on your reporting as usual. I loved reading this and could totally visualize the magic of it all. After reading this, all I can imagine is how we in Washington are going to handle this next year…If Eric thinks this was a complete cluster, just imagine it here. I drank a whole lot less coffee and hot chocolate than I wanted because trying to pee was the absolute worst for women, too. (And you are right–Bailey’s is for coffee, *not* hot chocolate!) It was a fun game, and I cheered myself hoarse at the US Olympics team announcements, but I don’t feel a driving need to do that again.